The White House is considering at least two troop withdrawal options as it weighs a new Iraq strategy - one that would preserve President Barack Obama's campaign pledge to get all combat brigades out within 16 months and a second that would stretch it to 23 months, two officials said Friday. A third, in-between option of 19 months is also being weighed, according to the officials, neither of whom would discuss the sensitive topic without being granted anonymity. One of the officials said the main focus appears to be on the 16-month and 23-month options; 23 months would run to the end of 2010. Under either timeline, the U.S. would hope to leave behind a number of brigades that would be redesigned and reconfigured as multipurpose units to provide training and advising for Iraqi security forces, one official said. These brigades would be considered noncombat outfits and their presence would have to be agreed in advance by the Iraqi government, which under a deal signed late last year insisted that all U.S. forces - not just combat brigades - be out of Iraq by the end of 2011. The concept of the stay-behind training and advising brigades has been well developed, the official said, although the details such as their size and composition are in an early stage of being sorted out. At the White House's request, top military officials recently offered an assessment of the risks associated with the 16-, 19- and 23-month withdrawal timetables, without saying which is preferred. Obama's top two defense advisers, Defense Secretary Robert Gates and Joint Chiefs Chairman Adm. Mike Mullen, have not yet provided a formal recommendation to the president on a timetable, an official said. 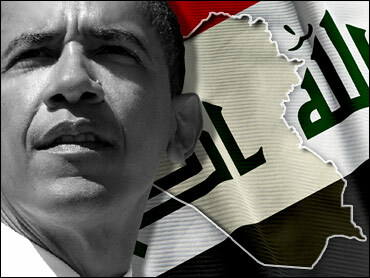 Obama must weigh a number of risks in deciding how fast to pull out the 14 combat brigades that are now in Iraq, including the political risk associated with abandoning his campaign pledge to get out within 16 months. The calculation is complex and tied to other concerns: relieving stress on war-weary troops and their families; tradeoffs in escalating the war in Afghanistan, and being ready for popup crises elsewhere. The pace and sequencing of a troop pullout will have implications for preserving recent gains in reducing violence in Iraq. An erosion of security could in turn halt progress toward political reconciliation, raising once again the prospect of widespread sectarian warfare and a new crisis for Obama. Also at issue is how to ensure proper protection for U.S. civilians, such as State Department members of military-civilian teams supporting Iraqi economic and political rebuilding, as the U.S. military presence shrinks. That civilian work, including the role of international non-governmental groups, will arguably grow in importance as the Iraqis focus less on fighting insurgents and more on building national unity. The fact that Obama did not immediately order his generals to begin withdrawing - as some might have expected, given his emphasis during the campaign on refocusing the U.S. military on Afghanistan - is evidence that he recognized, even before assuming office Jan. 20, the dangers of a precipitous withdrawal. During Obama's first meeting with the Joint Chiefs of Staff at the Pentagon last week, he did not mention a 16-month timeline, according to officials who were present. U.S. military commanders in Iraq - and some senior military leaders in the Pentagon - still wonder whether the Iraqi security forces will be ready this year to handle what remains of the insurgency without substantial U.S. combat assistance. If they are not, and if a U.S. pullout accelerates, what will happen? That question may be most important in northern Iraq, where the insurgency is still viable in the Tigris River city of Mosul and where ethnic tensions between Arabs and Kurds are high around the city of Kirkuk.